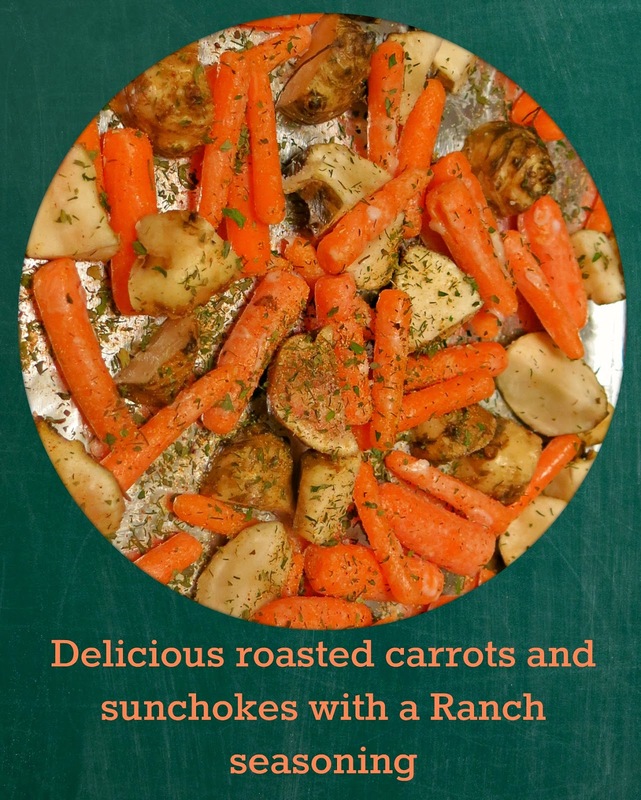 In a previous post I talked about making roasted sunchokes and carrots with a Ranch seasoning. Truthfully, you can use any kind of seasoning you like on roasted veggies, even just simple salt and pepper. Nevertheless, having mentioned Ranch seasoning, it seems only fair to share the recipe, right? Well, I don't exactly have a recipe. I just take a small, clean jar and dump in some salt and pepper, a dash of paprika, a little more than a dash of minced garlic, a spoonful of dried parsley, and a generous spoonful of dried chives. Then I shake it up and sprinkle it onto things as the mood strikes. And when I run out, I mix up some more that is maybe, not necessarily, probably not, but hopefully... at least SIMILAR to the last batch I made! I know that sounds pretty loose, but I make no apologies. Do you looooove garlic? Then why limit yourself to just a spoonful? Are you a huge fan of dill? Throw it in there; who cares if I don't have it listed?